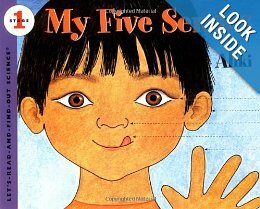 Teaching Blog Round Up: Who Knew The 5 Senses Could Be So Much Fun? How to gets kids, Pre-K through 6th, thinking & using language skills! Sneak Peek: Check out the "Scratch & Sniff" project, it's my favorite, & the FREEBIE. I start by reading this book. Click the image for a link to purchase it. 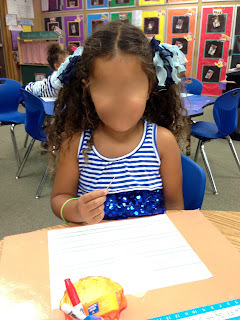 Here are some fun hands-on activities that I did with my Kindergarten class. You can modify up or down to meet the needs of your students, but I think that these activities will work from pre-K through 6th grade if you add a little more writing, research, or fun facts behind the science for each activity. This is what we did: You can find my "Sense-ational Adventure" book by clicking here. First I read a book about vision to the entire group. the sense we are learning about that day. children to explore on their own at a center. so they can put everything back in its place. we looked at our pupils with a mirror. You can take them outside to see how their pupils get smaller in the bright sunlight. we looked at the room with different colored glasses and rainbow glasses. we looked at each other's faces through a distortion lens (the large circular lens) and we looked at our fingernails through a magnifying glass to see our cuticles. we looked at optical illusions on little cards that change pictures when you move them. (Upper grade students love books on optical illusions. Have them research how the human eye works.) This is also a great time to bring out any periscopes, telescopes, and kaleidoscopes that you might have. After we tried all of the vision activities, we finished the sentence: I use my eyes to see. The children drew their eyes, including their pupils. They copied the word "eyes" from a pre-printed, lined card. This will be page one in our 5 senses "Sensational Adventure" book. First, I read a book about hearing to the entire group. 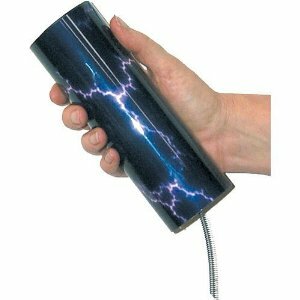 Then, we each got to come up and grab the spring on my "Thunder Tube" to make the vibration (and the sound) stop. You can see it in action by clicking HERE. And you can buy it here. In a small group setting, we tried out our "Listening Jars" which I made with old film canisters. First, I wash them out very well with soap and water to wash away any chemicals. Then, I filled 2 jars with pennies, 2 with rice, 2 with dried beans, 2 with plastic beads, and 2 with salt. We had fun matching up the listening jars. The answer key is at the bottom of the basket. I have an older version of this book that came with an audio tape. 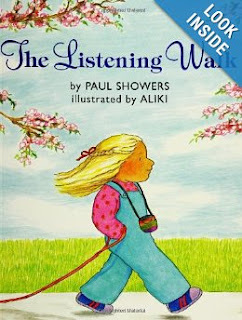 Last, we met again as a whole group and listened to the tape and book called The Listening Walk. Then, we lined up and very quietly went on a listening walk around the school. Last, we illustrated and wrote about what we heard on our listening walk. you can write it on a lined Post-it for them to copy. First I read a book about the sense of smell. Then, in a small group, we got to smell scented ink pads. I have stamping ink pads and bottles of ink for re-inking the pads in scents such as pizza, pickles, cherry pie, pine tree, grape, etc. After sniffing each of the ink pads and trying to identify the scent, we wrote about things we like to smell like cookies baking in the oven and our mom's perfume. As the students illustrated what they like to smell I asked each one what it was. I wrote it on a lined Post-it for them to copy. 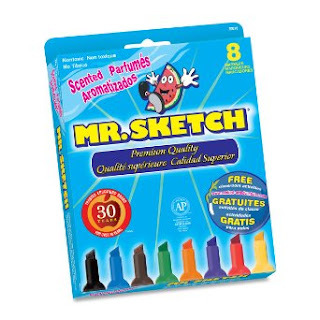 These cost much less than scented ink pads. First, I read a book about tasting to the entire group. Then, in a small group setting, I give each child a flat toothpick (they are a lot safer than the double pointed toothpicks) that has been dipped into a cut lemon so they can taste something sour. I wish you could see her face! Last, we wrote about things we like to taste. First I read a book about the sense of touch to the entire group. Then, they took turns placing their hand into 5 different fabric bags to feel the object in each bag. I placed one object in each bag; like a feather, a cotton ball, a piece of sand paper, a sponge, and a smooth rock. As the students felt the objects I encouraged them to describe the object as hard, dry, smooth, bumpy, rough, scratchy, soft, etc. instead of trying to name the object. After each child had a turn feeling what was in each bag, we tried to guess what the objects were. (Upper grade students can create their own "feely bags" to share with others or a buddy class. Then, we wrote about things we like to feel. We culminated the week by making "Scratch & Sniff Name Cards" with Jell-o. 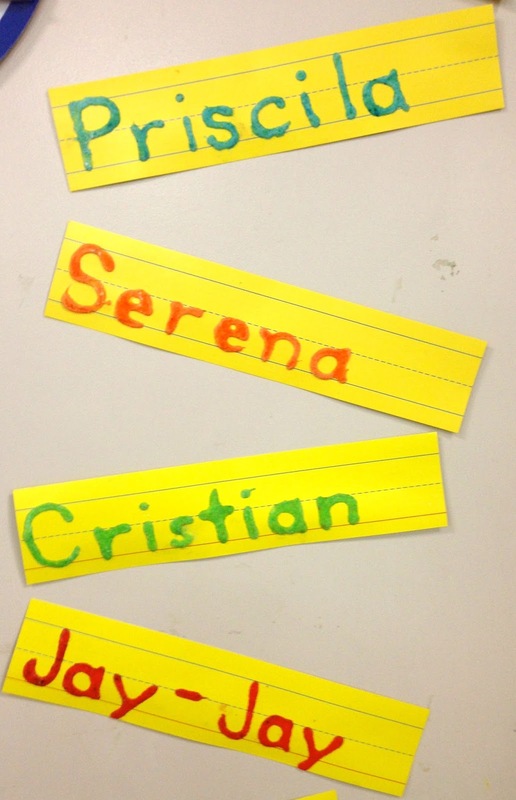 wrote each child's name with white glue on a lined card. As I wrote each letter, I talked about the straight lines and the curved lines each letter had. Then, the 1st child got to choose a flavor a Jell-o to sprinkle on the glue. Since the Jell-o doesn't always look like the color it will turn, I placed a piece of colored construction paper below each cup. over to reveal the brightly colored name. Set them aside to dry over night. When they are dry (the next day), I let the students come up to "Scratch & Sniff" their name. They can FEEL it, SMELL it, HEAR it, and SEE it. I tape these to the door, low enough so they can Scratch & Sniff their name or their friend's name too. 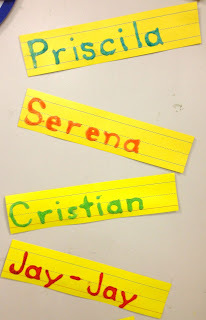 These are last year's names. We left them up all year. You can also create a "Process Grid" by printing pictures of eyes, ears, noses, mouths, & hands as well as things you can see (like a computer monitor), hear (like an iPod), smell (like flowers), taste (like a spoon of soup), and feel (like a puppy). Then, have the students place the cards on the chart. They may work together to discuss the photos and where they should be placed. My cards are laminated and attached with rolled masking tape. come off without tearing the grid. and hands on a Play-doh mat with Play-doh. And last, we celebrate each color with a color day every Friday. We dress in that color and taste something that is the color we are celebrating. Here is our Blue Day photo. We are holding up our organic blueberries. We got to see them, smell them, taste them, listen to see if they made a sound as we ate them, and we felt them. What fun! Click image for the link. *our FREE Crayon Box Organizer to help your students keep their jumbo or regular size crayons organized in the 8-count boxes. Free template comes in 2 sizes: Jumbo or regular. Our BLOG- KFUNdamentals It's where we keep the FUN in the FUNdamentals! So many great ideas for a unit about the 5 senses! I have to agree with you -- the scratch and sniff names are my favorite too!! :) Already pinned this, and I can't wait to try it out with my preschoolers! Teaching the scratch and sniff to my preschoolers. They're going to love it! Great ideas!